Few debates become as heated in investment circles as those between the advocates of active and passive investing. Duels are compelling. But focusing on this fight risks missing trends which are starting to appear elsewhere in the investment world. Three new reports on my summer reading list illustrate them well. My guiding view has been that investor flows would polarise into a barbell shape, weighted at both ends. At one extreme, investors would flock to passive funds and exchange-traded funds in order to access benchmark returns cheaply and conveniently. At the other, investors seeking higher returns would increasingly allocate to specialist fund managers investing in private equity, hedge funds, real estate and the like. The conventional fund managers, caught in the middle, would be pressured to up their game, become more specialised or merge for scale. Fifteen years after I first aired this hypothesis, it is striking quite how lopsided this barbell has become. Although investors have moved almost $3tn into ETFs and index funds globally, the real money is being made at the other end. 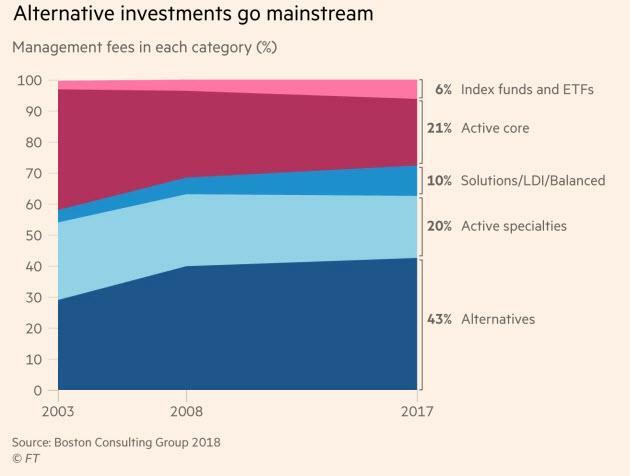 Forty-three per cent of all the management fees in the investment industry went to alternative asset managers in 2017, up from 29 per cent in 2003, according to new research by Boston Consulting Group. But even this understates the purple patch firms have enjoyed from low rates and changes in bank regulation. If you include an estimate of performance fees, then the alternative strategies now represent over half of the fees paid by investors for the first time. One thing I did not expect was that investors would still be paying almost the same level of fees, on average, as they were 15 years ago. Even though technology has enabled investors to save billions via ETFs, index funds and cheaper mutual funds, large investors have upped their risk and fee budgets on high margin private equity, hedge funds and other specialist managers instead. Understandably, investors are starting to become pickier about value for money - and some of the largest Canadian, American and global schemes are trying to make savings by doing more in-house. But I do not anticipate this will fundamentally alter the lopsided pattern of investment any time soon. At the other end of the barbell, the march of passive investing has been one of the defining themes of asset management over the past decade. ETFs have grown 17-fold since 2003, and may double again over the next four to eight years, according to BlackRock. ETFs have democratised access to investing. Individuals can now save for their retirement in ways only previously available to sophisticated institutional managers. But the good news for investors hasn’t translated into the same degree of success for the firms. As the benefits of technological innovation and industrial scale have been passed on, ETFs represent just 3 per cent of industry fees paid, according to BCG. Indexing has come in for much abuse: it has been called Marxist, and even a weapon of mass destruction. Hyperbole aside, it is clear that the dramatic growth of ETFs has thrown up a number of public policy questions. Do passive firms risk becoming absent landlords, for instance? Intriguingly, firms at either end of the investment barbell are starting to work in tandem. An updated piece of research by Ian Appel at Boston University demonstrates that the managers of ETFs and index funds are starting to vote far more frequently with activist and engaged investors. Indexers are starting to recognise that as stewards of stocks they have no option but to engage, hiring the same proxy voting services as traditional firms, or beefing up their governance teams. The study shows that a high passive share has materially increased the odds of activist success, both in proxy fights and getting board representation. Not all activist ideas are good, by any means. But markets do need a diverse range of engaged investors. Companies should be on alert for this potentially symbiotic relationship. Investors have become much fussier in the middle of the barbell, meanwhile, challenging fund managers to adapt. Expectations for traditional fund managers’ future growth have fallen so much that a new Goldman Sachs report suggests that outside crisis periods, US firms are now trading on their lowest multiple of future earnings ever. Growth is low and very unevenly spread but some distinctive strategies are still being rewarded by investors. The pressure from clients for performance and better value for money as they harness technology will be unrelenting. But for the industry, it’s not just a simple active versus passive duel.